18 new stocks make our Most Attractive list this month, and 17 new stocks fall onto the Most Dangerous list this month. 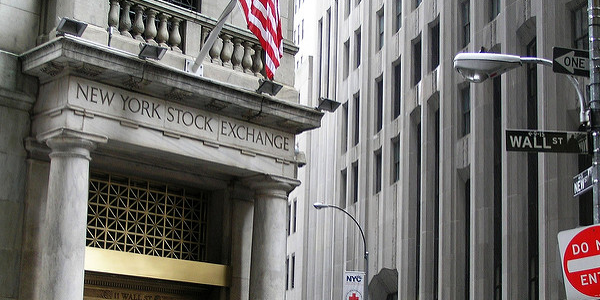 April’s Most Attractive and Most Dangerous stocks were made available to members on April 3, 2019. AutoZone Inc. (AZO) is the featured stock from April’s Most Attractive Stocks Model Portfolio. From 2008 to 2018, AZO grew after-tax profit (NOPAT) by 8% compounded annually and revenue by 6% compounded annually. AZO’s trailing twelve months (TTM) NOPAT has grown by 22% over the prior TTM period. AZO’s ROIC has improved from 19% in 2008 to 26% TTM while the firm’s NOPAT margin increased from 11% to 15% over the same time. Although AZO is up over 70% over the past year, the stock still remains undervalued. At its current price of $1,055/share, AZO has a price-to-economic book value (PEBV) ratio of 0.9. This ratio means the market expects AZO’s NOPAT to permanently decline by 10%. This expectation seems rather pessimistic for a company that has grown NOPAT by 8% compounded annually over the past decade. If AZO can maintain TTM NOPAT margins (15%) and grow NOPAT by just 5% compounded annually for the next ten years, the stock is worth $1,583/share today – a 50% upside. See the math behind this dynamic DCF scenario. Income Statement: we made $1 billion of adjustments, with a net effect of removing $215 million in non-operating expenses (2% of revenue). 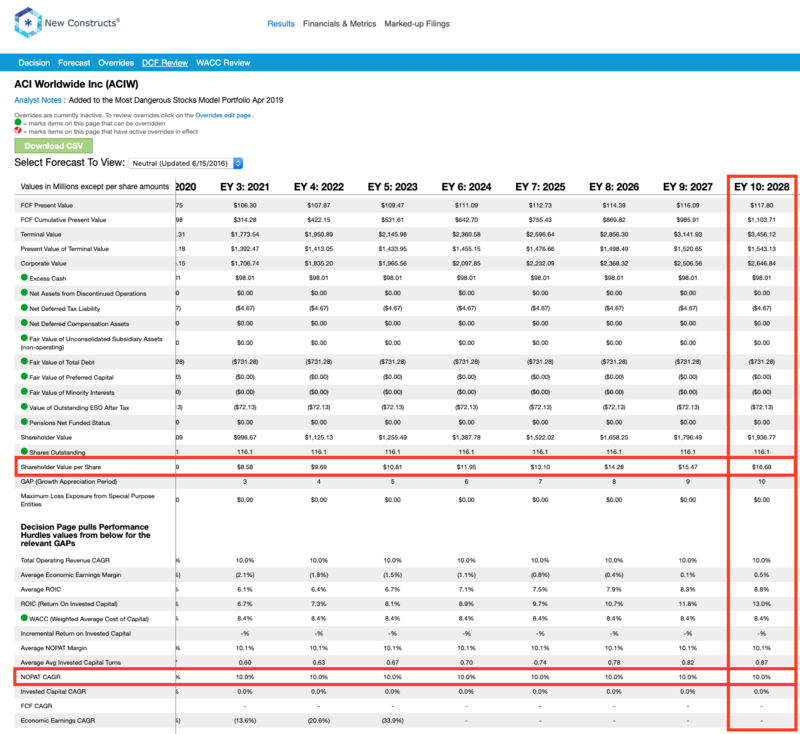 You can see all the adjustments made to AZO’s income statement here. Balance Sheet: we made $2.3 billion of adjustments to calculate invested capital with a net increase of $2.3 billion. One of the largest adjustments was $1.7 billion in off-balance sheet operating leases. This adjustment represented 40% of reported net assets. You can see all the adjustments made to AZO’s balance sheet here. Valuation: we made $7.7 billion of adjustments, all of which decreased shareholder value. Apart from total debt, which includes the operating leases noted above, the largest adjustment to shareholder value was $638 million in outstanding employee stock options. This adjustment represents 2% of AZO’s market cap. See all adjustments to AZO’s valuation here. ACI Worldwide (ACIW) is the featured stock from April’s Most Dangerous Stocks Model Portfolio. Investors who look at GAAP net income would think that the company’s profits recovered last year. GAAP net income increased from $5 million in 2017 to $69 million in 2018. However, economic earnings, which measure the true cash flows of the business, decreased from -$24 million to -$57 million over this same period. We believe ACIW rising 25% this year, despite the firm’s deteriorating fundamentals, means noise traders are buying into the company’s reported profit growth and not digging deeper. When we do so, we find that ACIW remains significantly overvalued. 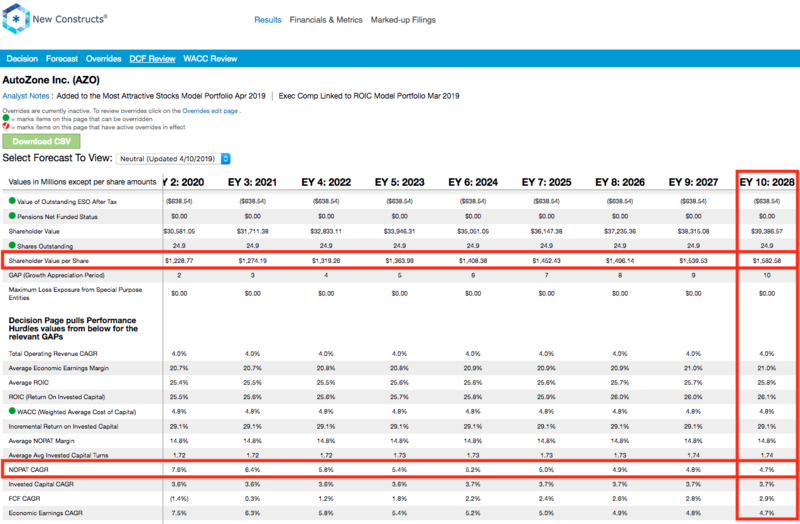 To justify its current price of $34/share, ACIW must improve its NOPAT margin to 17% (compared to 10% in 2018) and grow NOPAT by 18% compounded annually for 12 years. See the math behind this dynamic DCF scenario. This expectation seems unrealistic given that ACIW’s NOPAT has declined by 3% compounded annually since 2014. 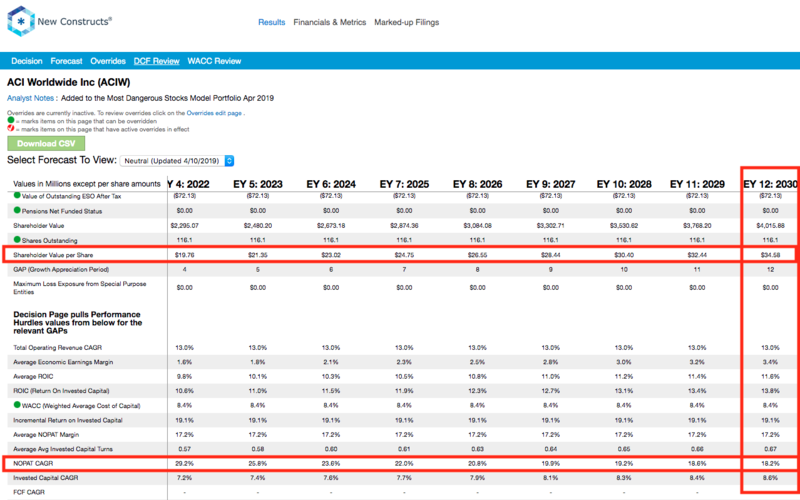 Even if ACIW can maintain 2018 NOPAT margins (10%) and grow NOPAT by 10% compounded annually for the next decade, the stock is worth just $17/share today – a 50% downside. See the math behind this dynamic DCF scenario. Income Statement: we made $65 million of adjustments, with a net effect of removing $33 million in non-operating expenses (3% of revenue). You can see all the adjustments made to ACIW’s income statement here. Balance Sheet: we made $587 million of adjustments to calculate invested capital with a net increase of $77 million. One of the largest adjustments was $125 million due to goodwill. This adjustment represented 7% of reported net assets. You can see all the adjustments made to ACIW’s balance sheet here. Valuation: we made $906 million of adjustments with a net effect of decreasing shareholder value by $710 million. Apart from $731 million in total debt, the most notable adjustment to shareholder value was $72 million in outstanding ESO’s after tax. This adjustment represents 2% of ACIW’s market cap. See all adjustments to ACIW’s valuation here.